Several weeks ago I showed you how to make some faux Robin eggs. I have quite a few of them hanging around here and wanted to make a little nest for them. Starting with a cheapy little flat basket that I had on hand, I gathered a few sticks and tucked them into the basket. 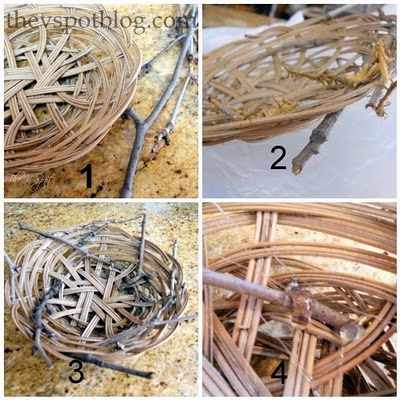 I fired up the glue gun and drizzled glue over the sticks and back and forth across the basket. Working quickly, Spanish moss got pressed into the glue on the inside of the basket. I added in the eggs and glued them to the moss. Next I added in sheet moss that had faded and looked more brown than green. I just tucked it here and there until it looked random enough to suit me. It’s free. I had all of the stuff on hand. It’s versatile, I can tuck it into a planter outside or keep it in. When the season is over, I’ll pull the eggs out and toss the rest. No storing it. I can just make it again next year…. … ‘cuz it’s fun to do. I think you were a bird in another life. I voted and I’m pretty sure I know which one is yours…because it was my favorite. Pretty sure I know which one is yours too. I voted! i voted. I soo hope i got it right. You just have to win…you’re so crafty!!! I voted 🙂 good luck!! I love the nest. I saw one on Miss Mustard Seed a month ago…now to find an old basket and some moss. Sweet! I’ve become addicted to nests…I’m going to vote! Gah, I hope I vote for you!!! LOL! Beautiful! I love the variety of textures. You are so creative. Love how you take things you have laying around and make something great out of them! This project is stunning. Thanks for yet another awesome project! This is such a quick idea for a nest. It turned out great. Thanks for sharing it. The little nest is adorable! I am on my way to vote. very cute and crafty, the eggs look real. thank for sharing this at my party! That was fun to see how you created it. Very seasonal. Great job. So beautiful, I love how it turned out:) Thanks for linking up! Cute nests. I just voted. Hope I voted for the right one. Wouldn’t you know, I just tossed out one of those cheapy little flat baskets! Cute way to do the nests. Love it! I just found your blog through Kara’s linky party. I am now your newest follower. Come check me out if you get a chance. great project! thanks for linking up to our party. Hi Vivienne, I found you through Alison’s Friday’s Unfolded. I love your little bird’s nest. I just so happen to have a basket just like the one you used, so I’m going to have to make one of these. Thanks for the lesson. Now I need to go look at the robin egg tutorial! Loved your original post on creating the eggs. This addition just put it over the top. The nest looks adorable! I love me some birdies, nests, and eggs. I absolutely love your nest! Spring truly has sprung. This post may have just saved me some serious embarassment. I have wanted a nest for a while now and our neighbors have a perfect one but it’s still in their tree lol. What do you think they would think if they came out and saw me in their tree trying to fetch their nest?? haha. Thanks for linking up at the VIP party! This turned out great. I have to say that I will definitely be copying this once I get my eggs made. This is a gorgeous craft – as usual. I love your clean up tip! This is so great! It looks darling and is actually something a craft-challenged person like myself could do. 🙂 Thanks so much for linking it up this week Vivienne! So adorable! I’m bookmarking this post so I can make the nest myself. Thanks for sharing!!! So great! I love how it turned out. Thanks for stopping by and linking, have a wonderful weekend! Great idea for a nest. I’m off to find out how to make the eggs. so pretty and elegant. the robin eggs really stand out. saw you on fine finds. SO CUTE!! THANKS SO MUCH FOR INKING UP!!!!! That’s so cute! And so cheap! Great idea! What a sweet nest! I hope you stop by the Tuesday To Do party and share it! Wow these are great! so glad I stopped by, coming from Kims’s! thanks for sharing this at my party! so cute! This is awesome! You are so talented. I voted on OMTWI earlier, hope I voted for you! 😉 thanks for sharing this at Fantastic Friday. How do we know she’s not a bird in this life? 😉 Cute project!! Wow! This is so awesome. I’d love to try this. It looks fabulous! Awesome idea! Thanks for linking up! Love this! Thanks for linking up with me for Friday Favorites. This is beautiful!! Thanks so much for sharing at Make Something Mondays! Can’t wait to see what you have this week! !